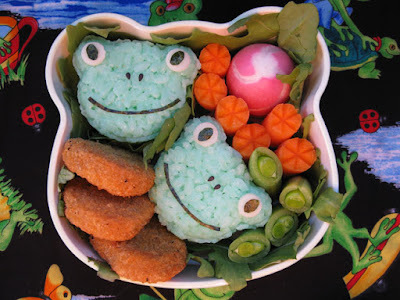 No frogs were harmed in the making of this bento. Aaaag! Isn't this the cutest thing evah!?! I picked up this bento box at Uwajimaya in Seattle. And of course, I had to fill it with frog onigiri. This idea came from a wonderful new book that I also picked up at Uwajimaya, called Yum-Yum Bento Box. If you are interested in learning how to do bento boxes, I really recommend this book. It has so many great ideas. To make the frog onigiri, I tinted the rice with green food coloring, and used my teddybear onigiri mold to make the frog faces. Their eyes are provolone cheese and nori, nori smiles, and black sesame seed noses. There are also carrots, arugula, a radish and sugar snap peas from Crescent Moon Farms, and chicken nuggets. The frog bento box has an upper compartment with a air tight lid, and I put in some overly ripe mango slices (they kind of turned to mush), and cherries from the farmers market, with a little slice of lime. Wine Pairing Suggestion: This is a fairly light, and definitely fruity (and completely silly) bento lunch, so how about some bubbly? What could be better with a frog-themed bento box lunch, than a glass of Toad Hollow Vineyards Amplexus Crémant Brut Sparkling Wine? It's toadally delicious. And the folks at Toad Hollow have great senses of humor, which would pair so well with this lunch. 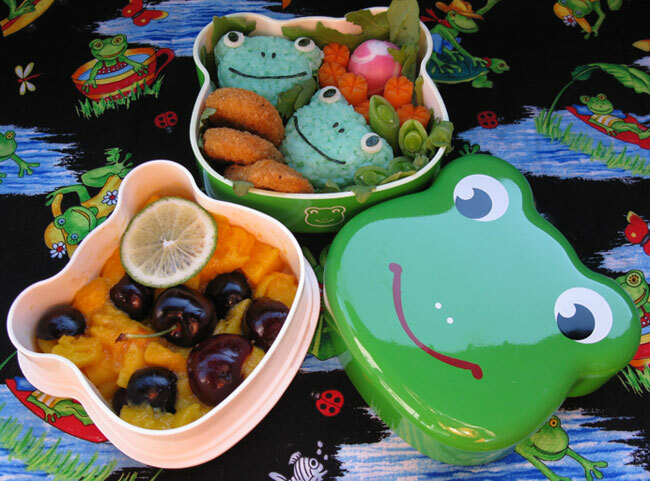 Your froggy bento is so CUTE! Really well done! Perfect shade of green, and sweet inquisitive faces...officially kawaii!! I live, work, cook, and play in Sonoma County, California. Our year-round farmers markets make it easy and fun to eat healthy, seasonal food. I also love nail art, and will share it with you here. Leave The Gun. Take The Cannelloni.